It’s been several years since Security Ninja was published for the first time. This impressive security plugin had been featured on CodeCanyon, and since then, thousands of users have been paying for this cute bodyguard to watch over their WordPress sites. Those same users were happy to give money for the premium plugin, but now times have changed – Security Ninja is completely free and you can download it from the WordPress plugins repository now! Security Ninja is one of those WordPress plugins which you just have to have up and running. Instead of worrying about malicious files or hackers intruding your personal web space, the ninja will do the job for you. In just one click of the button, Security Ninja will scan your entire website and will inform you about any security issues. There are more than 40 tests which include brute-force attack on user accounts to test password strength, different installation parameters tests, it will check for file permissions and help you hide the version of WordPress you’re using, run Apache and PHP test, it will check the options file and much, much more. Depending on your site, it might take a minute or two for the tests to complete. After that, Security Ninja will inform you about all potential problems on your site. For now, you will be able to see all the problems, and you will get detailed instructions on how to fix the issues. But to make the plugin even better, the developers have started working on a new add-on which will automatically solve all the problems for you. What more could you ask for? The free plugin can help you a lot, and we recommend giving Security Ninja a try on all of your WordPress sites. The plugin is relatively small in size and won’t take much of your space, and it won’t slow down your site by any means. Running tests should be a thing on your schedule, and since it requires only a click from you, it should be something you’ll do on a regular basis. To make thing even better, there are already several add-ons for the plugin which can help you secure your site on a completely new level. The first add-on this ninja carries is the Core Scanner add-on which will keep an eye of all the original WordPress files. Malware Scanner is dedicated to fighting malicious custom files found on your site, while you can make everything much easier and schedule the tests with Scheduled Scanner add-on. We can’t forget about Events Logger add-on which is designed to track all the activity on your WordPress powered site. With this last add-on, you’ll get to trace every step users do on the site which means you get to know who deleted what, when they logged in, etc – particularly useful for larger sites with lots of users. 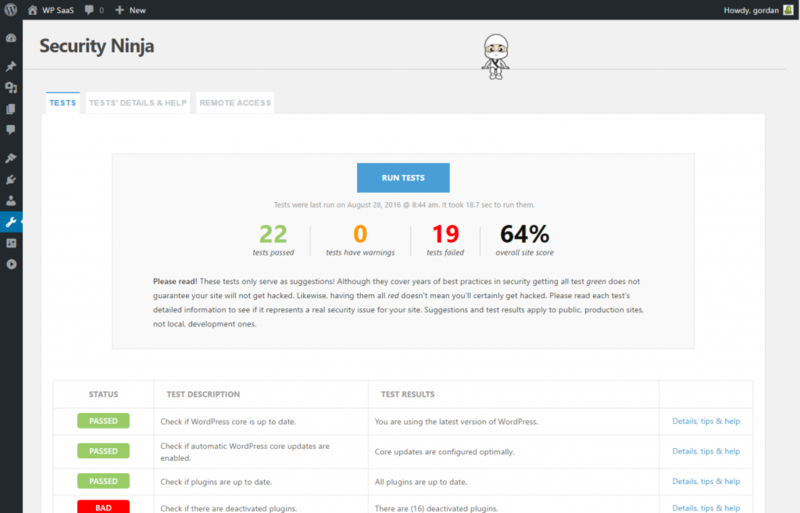 Again Security Ninja is now free, so it doesn’t cost you anything but a few minutes of your time to test this excellent security tool – don’t let your WordPress site get hacked when you can prevent it so easily.